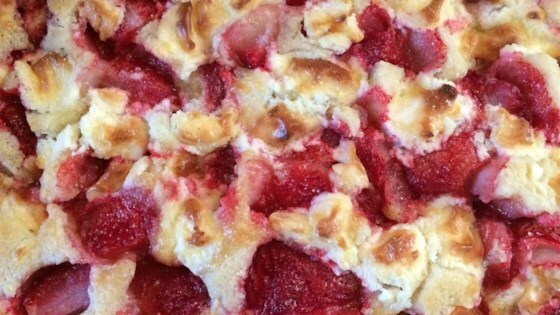 "I recently saw a recipe online for strawberry cream cheese cobbler. Well, this is my version. It is awesome!" Pour melted butter into the bottom of a 9x13-inch glass baking dish. Mix milk, flour, sugar, baking powder, and salt together in a small bowl; pour over the butter in the baking dish. Arrange strawberry halves in a layer into the baking dish. Dot the strawberries with the cream cheese pieces. Bake in preheated oven until top is golden brown and edges are bubbling, 30 to 45 minutes. You can omit the baking powder and salt, if you use self-rising flour. I loved it, and was not difficult to make. Now my kids 19 and 22 were a little more critical than me. So I told them to get a job. I am not crazy about the little chunks of cream cheese. The cream cheese adds such good flavor, and the crust around the edges is so good! I melt the butter right in the pan in the oven while it is preheating.